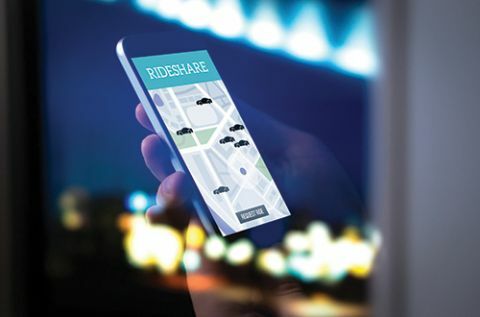 As TNCs penetrate deeper into more locations, and if driverless vehicles lower the cost to use TNCs as widely expected, there could be significant further erosion of traditional sources of revenue from rental cars, taxis and parking. Airports are working to protect their bottom lines by updating traditional strategies regarding parking infrastructure and curbside management. According to a 2016 report from the Airport Cooperative Research Program, more than 90 U.S. airports permit TNCs to operate on their properties and 48 levy associated fees. According to research by Walker Consultants, TNCs may reduce airport parking revenues by up to 40%. Senior Vice President Mary Smith doubts that the impact will be worse because not all travelers will choose TNCs and rural passengers without access to TNCs will still drive to/from the airport. In addition, surge pricing discourages some passengers in metropolitan areas from using TNCs for airport transit during rush hour or other times of peak demand. While many airports are still reporting static parking revenues, Walker is noting subtle changes among its client base. The impact varies by airport. At some, receipts in short-term or single-day parking at the terminal are down, while revenue from remote economy and long-term lots are holding steady. Smith attributes this to fewer “meet-and-greets”—more parents telling their college kids to “Uber” of “Lyft” home from the airport, for instance. At other airports, longer term and economy parking is more affected. Business travelers also seem to be embracing TNCs. According to information compiled from expense reports that Certify processes for its Fortune 500 clients, TNC use soared from 8.1% in 2014 to 63% of ground transportation charges last year, while rental car bookings dropped from 55% to 29%. Taxi use also declined during the same period, in roughly the reverse proportion to TNC charges. While this data doesn’t only address ground transportation to/from airports, it demonstrates the overall growth in the use of TNCs, notes Smith. Although TNCs have not yet reached a saturation point in established markets, their rate of growth may have slowed, she reports. Public transit trips to/from the airports are also reportedly falling in Portland, San Francisco, Oakland and other cities. Walker has found that most timelines predict that TNCs will begin using autonomous vehicles as soon as next year; and by 2025, they will have a “fairly significant number” going to/from airports. Around 2027, passengers will be using their own autonomous vehicles—and they won’t pay extra to park near the terminal, because they will summon the driverless vehicles from remote lots, explains Smith. In the past, parking revenue typically moved in tandem with passenger volume, particularly originating enplanements. But these days, some airports are seeing parking revenues level off while enplanements continue to climb. State law in Florida requires JAX and other airports with user fees to charge taxi drivers and TNC drivers the same amount. (Some airports outside Florida voluntarily follow similar parity policies.) Grossman and other airport directors note that income from such user fees is a “wash,” while the associated loss of parking revenue can total millions of dollars for each airport. “That’s not chump change,” emphasizes Grossman. At OAK, parking revenue continues to increase; but it is no longer growing in “lock step” with passenger enplanements, observes McKenney. Nevertheless, it is difficult to draw an accurate direct cause-and-effect relationship between higher TNC usage and slower parking growth due to changes in other factors, such as the airport’s increase in international carriers, longer haul services and connecting passengers, she notes. Seattle-Tacoma International Airport (SEA) experienced record passenger growth last year—and while parking transactions remained flat from 2016 levels, parking revenues were up 7%. Airport personnel largely attribute the revenue gains to an aggressive marketing program that targets leisure travelers who tend to park longer than business travelers. Parking revenue has grown faster than passenger enplanements for four consecutive years, notes airport spokesman Perry Cooper. SEA recently completed its second year permitting TNCs at the terminal. According to Cooper, early anecdotal evidence indicates that TNCs may be impacting private off-site lots rather than the airport’s parking options. There are more than 30 private parking lots surrounding SEA, he notes. While changes to parking garages and surface lots seem likely, they typically take years to develop and execute. In the meantime, some airport operators are taking action and updating their curbside management programs. Curb space is, or will soon be, a premium commodity; and loading zones need to be convenient for both taxis and TNCs, cautions Smith. Most airports do not give priority to TNCs, even if they are now their biggest source of ground transportation user fees, she observes. Pressed for space, some airports are leveraging existing square footage within their adjacent parking facilities. SEA, for example, uses the third floor of its garage for TNC and taxi loading. Flexibility is paramount, Smith emphasizes. She recommends using moveable bollards rather than permanent structures to designate TNC loading zones, because they will undoubtedly need to grow over time. “You want to avoid chaos with the passengers going all over the place,” she remarks. Airports with ground transportation facilities currently in the design stage are devoting “huge capacity” for TNCs, Smith reports. The new center currently under construction at Nashville International Airport, for instance, was specifically designed to accommodate growth in the TNC sector. The new facility is scheduled to open this summer. Instead, OAK allows “re-matching” and “pre-matching,” so TNC drivers can pick up new passengers shortly after dropping off their previous fares. SEA provides a hold lot for TNCs about one mile from the terminal, near a similar area for taxis. Cooper notes that SEA requires TNC vehicles to meet the same emission standards as taxis, and most TNC drivers serving the airport use hybrid or other environmentally friendly vehicles. As rental car usage drops, so will the income airports collect in related user fees and facility charges. Smith, however, predicts that rental car companies will eventually become fleet managers for autonomous vehicles operated by TNCs. They have the resources and scale to provide cleaning, and both light and heavy maintenance, at large scale in cities. When this occurs, the associated excess space in rental car centers could ultimately be used to service and maintain the driverless vehicles. This is a significant risk to the current financing structure of consolidated rental car centers, and airports should explore collecting fees for vehicles maintained or housed on their property, she advises. Smith also reports some futurists foresee U.S. carriers using autonomous vehicles to transport premium passengers home or to their hotels to match the door-to-door service currently offered by upscale Middle Eastern airlines. Because such TNC service will cut into ground transportation fees, parking and terminal sales, airports should expect further challenges to their revenue streams, notes Smith. From an accounting standpoint, OAK separates its ground transportation services and facilities from its terminal and airside operations, and consequently sets parking rates and TNC/taxi user fees to cover their own costs. Even though the airport does not offer covered parking, it is able to command rates close to covered facilities run by off-site competitors, notes McKenney. OAK personnel are watching changes within the TNC industry and considering whether to adjust TNC user fees accordingly. For example, both Uber and Lyft now offer “pool” fares to passengers who share rides. Fares are lower for individual passengers, but fuller cars earn the company more money. Currently, OAK levies one user fee per car, rather than charging individual fees for each person inside, but it is currently reviewing this strategy. The management team at JAX is also assessing how to keep pace with changes in ground transportation. The recent paradigm shift that allows passengers to save money by using TNCs is requiring airports to contemplate associated paradigm shifts, reasons Grossman. For example, JAX is exploring the idea of charging private vehicles a small fee for driving on airport roads to drop off or pick up passengers. “Our customers may not like that much, but the airport is forced into looking at it,” he explains. In a similar vein, the airport could decide to collect revenue from vehicles that use an access road on its property as a short cut to avoid more heavily congested roads. Transponders used to collect toll road fees could be used to collect airport road fees, says Grossman. Parking has long been a kingpin of non-aeronautical revenue. According to FAA data, U.S. commercial airports generated $4 billion in parking and ground transportation revenues in 2016 alone. That number may be dropping, though, as more passengers arrange pickups and drop-offs from Uber, Lyft and other transportation network services (TNCs). Airports throughout the country are consequently re-tooling parking programs to keep needed revenue flowing from their existing garages and lots. With the advent and growth of TNCs at Seattle-Tacoma International (SEA), the airport plans to implement an online parking pre-booking system later this year that will allow it to dynamically price parking based on customer demand and available garage space. In 2009, SEA responded to a downturn in parking associated with the Great Recession by launching a marketing program targeted at leisure travelers who traditionally park off-site or take other modes of transportation to the airport. These travelers typically park for longer periods of time than business travelers, so attracting more leisure travelers has helped increase the airport’s parking revenue, explains SEA spokesman Perry Cooper. The program now accounts for 20% of all annual parking transactions, he reports. The airport also offers unlimited parking in its garage, on a floor with direct access to the terminal, for $350 per month. Currently, about 800 passengers belong to the program. The airport hopes to increase participation by promoting the program within the terminal and through digital marketing. Jacksonville International Airport (JAX) offers travelers unlimited parking for $200 per month. The Florida airport developed its Premier Parking program for frequent business travelers about five years ago and is currently operating at full capacity—150 customers—with 50 more on a waiting list. Capacity for the program is limited by the size of the surface lot dedicated to the program. 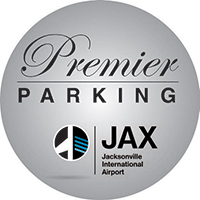 Another 1,000 travelers participate in JAX’s frequent parking program, which awards points for free parking or discounts on purchases within the terminal. 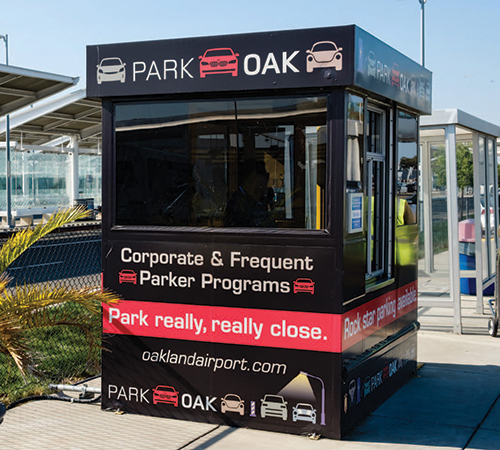 Oakland International Airport (OAK) uses online parking coupons to support its air service development efforts. Customers can receive several days of free parking if they fly on select airlines to specific featured destinations. The airport also offers a corporate parking program, which provides discounted rates to about 2,800 drivers from roughly 1,500 participating companies, and a separate frequent parking program, with about 2,000 participants. The airport recently upgraded its parking systems, enabling additional customer offerings. In Florida, it is more profitable to construct facilities and lease space to tenants rather than leasing land to professional developers, he explains. The recent loss of parking revenue is another reason that airports need a hike in the passenger facility charge, adds Grossman. He would also like to see more latitude allowed in the type of projects that can be funded with PFC revenue. McKenney hopes that political and regulatory bodies will address new transportation technologies proactively, which would greatly aid airports in integrating new innovations. “Some are already thinking about autonomous vehicles,” she exclaims with relief. Time is also a primary factor affecting future infrastructure projects. A planning study completed for JAX three years ago advised building a garage for the sole use of rental cars within five to seven years. A separate study recommended constructing another public parking garage in four to five years. Given all the recent changes, Grossman estimates that there is a 50-50 chance that neither facility will be needed.